Last Thursday, I was enjoying driving my Datsun down to Westminster. I was stopped at an intersection when CRASH my car was hit on the rear passenger corner. How depressing. Anyways, the car was my baby. It only has 46K original miles. The suspension was in excellent shape (I stripped the paint and had the parts powder coated- very nice). The body had a little rust, but not much. This car lived most of it’s life in a garage. I purchased most of my parts, like the anti-sway bars and the exhaust from Motorsport auto. It has nice headers, Dual Weber Carbs, and an electronic ignition. I don’t think that the body is repairable, but there are still lots of useful body parts. The glass is all good as well. The engine is in excellent shape. 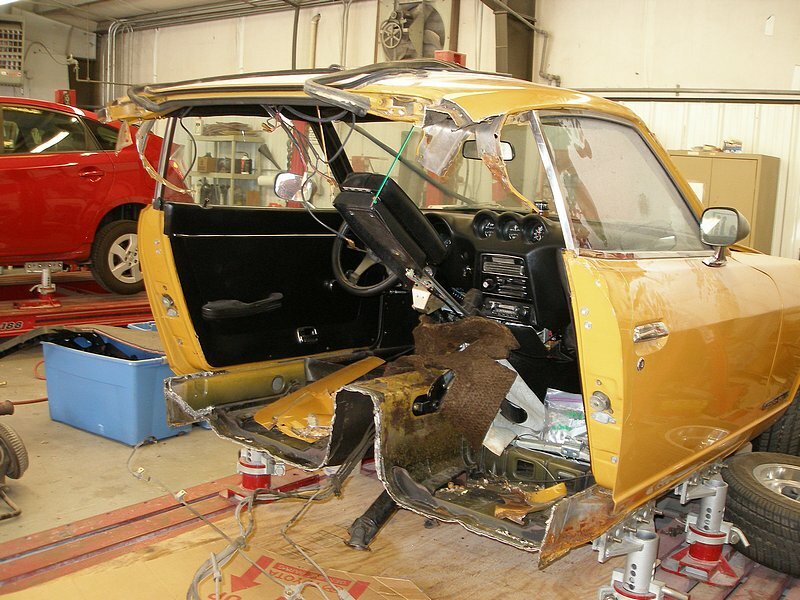 Even the interior was in decent shape…before the accident. (The other driver claims that she looked down for a moment just before she crashed into me). I’m checking to see if you-all can help me put a value on the car as a parts car. I have photos that I can share of the car before and after the accident. It’s also helpful if you can help me to put a value on a car like this before the accident. Any documentation is helpful ammunition to throw back at the insurance company. 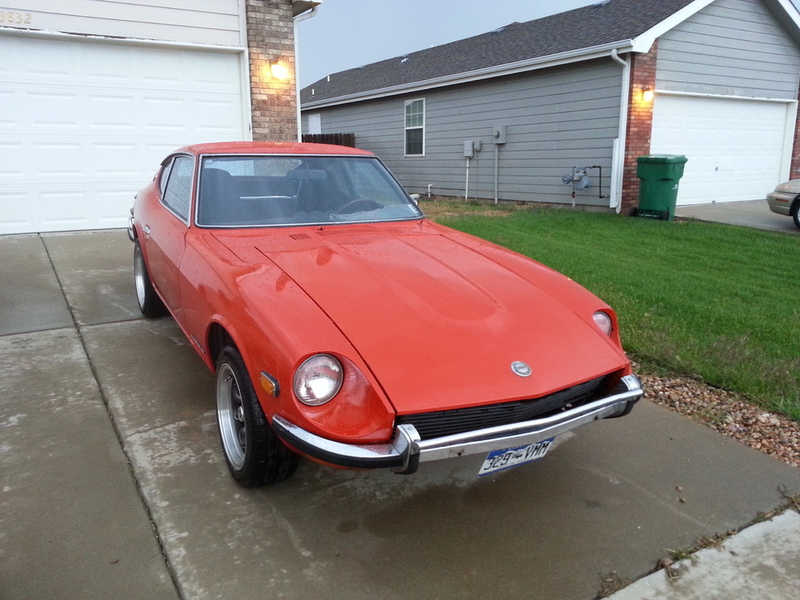 Thank you, and I hope to be a Z-Car owner again soon. -Brad P.S. This crashed car is for sale. I realize the car is for sale but have you priced fixing it? It seems a shame to part out a solid car with low miles. Parts are available. PM sent, I have the entire section (in orange) to repair it. That car looks very fixable. What are you asking for the car the way it sits? Is it at a salvage auction? P.S. This crashed car is for sale. Sorry to hear about your loss. Hope you are OK. Such a tragedy when this happens, especially to someone who took such good care of the car. Good luck with your venture to find another car and the future of this little gem. 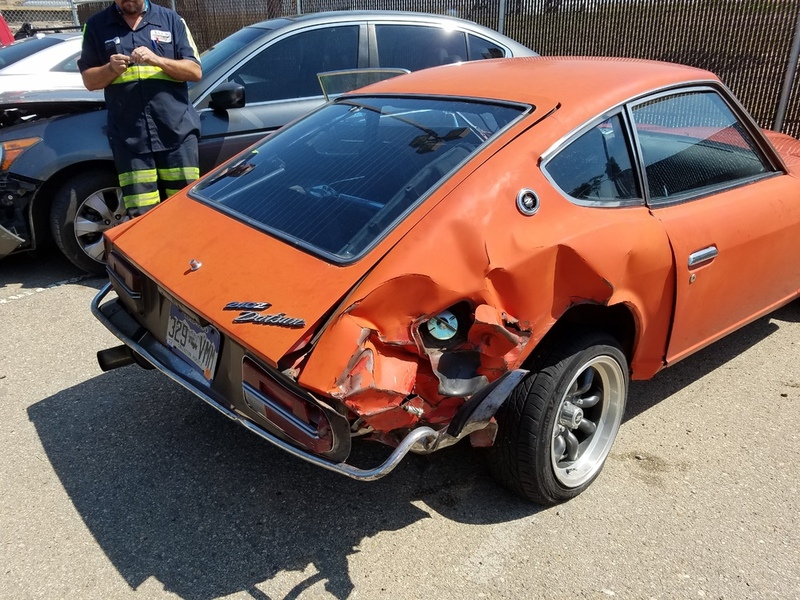 was this a daily driver, what kind of insurance did you have? You mean like looking at a cell phone perhaps? I would have to have been restrained from hurting somebody. A few hours on the frame rack and that could be roughed out and ready for a new/used quarter. Even at home i've pulled out some pretty kinked up quarters with my homemade I-beam and 20 ton ram. 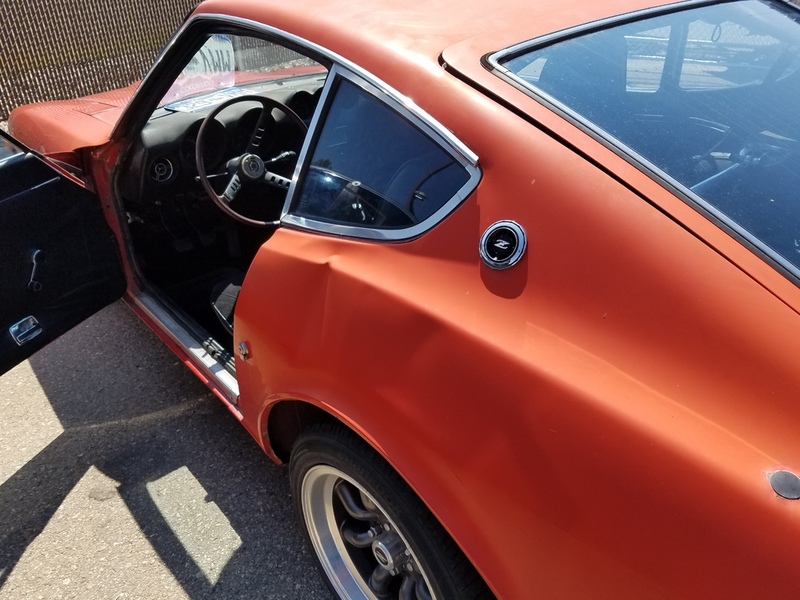 I have seen people go to extremes to not show any collision damage but if he's willing to put up with a few bumps and waves in the floor then by all means its fixable with just a quarter panel and tail lite panel replacement. Fixing it may be a bit beyond me. I may have to keep it in mind depending on how the insurance works out. Thank you. I appreciate your input. I may need to sell it to someone that is willing to put it back together. I don't know how to value it right now, so I don't have an answer to your question. It's in a towing yard right now. It's future is still unclear. Thanks. I'm okay, a bit twisted up. It was a daily driver for a little while. I just started driving after having it garaged for a very long time. The other drivers insurance is covering the entire loss. I did not have a stated value for the car, as I did not know that was needed until now. So, I need to prove it's value. Here's a photo before it was crashed. Thank you for your concern. I'm still kicking. Here's a photo that shows how hard it was hit. The fold in the body behind the driver's door was actually caused by being hit on the rear of the passenger's side. Wow glad you're ok. If you do decide to sell it how it sits I'd be interested. I sent you a PM. Its a good thing the insurance is covering the entire loss. It was a beautiful car before the accident. I don't have near as much experience as most members here but I'd value the car in the mid teens before the crash. Is it a automatic or manual? I'm so sorry for your loss. My '73 is insured with Hagerty for $18K, 90,000 original miles. Her insurance co. will fight you hard for their money. They will try to undervalue it so be prepared to lawyer up. Get hold of your insurance co., too. You are going to be doing battle with her insurance co. FWIW, my son is a trial lawyer in Boulder. He owns a '77 Porsche SC and he would be worth a call. He loves to do battle with insurance companies. PM me and I'll give you his info. BTW, I've been thinking about selling my car. If you are interested let me know. Perhaps we can work something out. BTW, I've been thinking about selling my car. I have been thinking about the same thing. I just don't enjoy driving it as much as I did. The main reason is everybody is in a hurry and not looking where they are driving. Somebody is always tailgating me. Its driving me nuts. This is why I only drive the Z less than 1,000 miles a year. More like 500 miles lately. I have had a lot of close calls recently just with my daily driver. At least daily drivers are easy to replace.